DESCRIPTION Stunning RENOVATED townhome in the heart of MARDA LOOP. 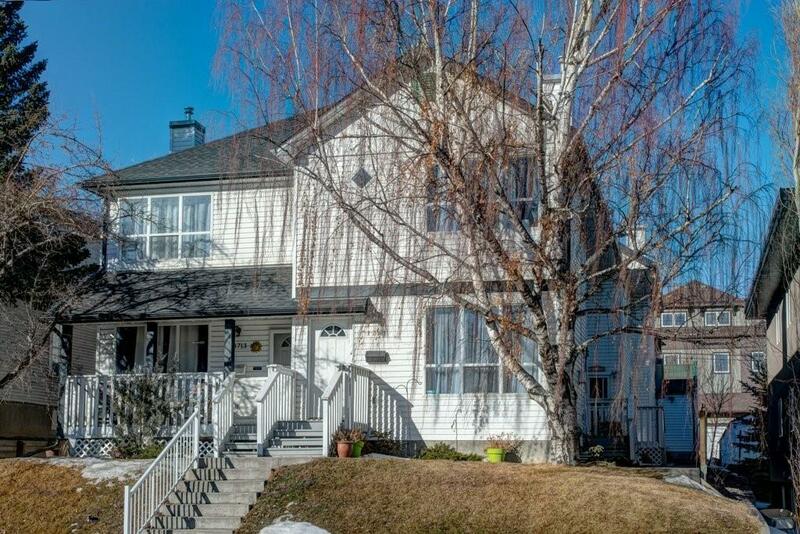 This 2-storey townhouse will have you loving life in one of Calgary’s hottest neighbourhoods. As you enter the stylish open concept main floor complete with NEW kitchen: stylish two tone CABINETRY, QUARTZ COUNTERS, NEW LIGHTING, NEW BACKSPLASH, NEW STAINLESS STEEL APPLIANCCES. Modern fireplace and hardwood throughout is the perfect entertaining space. Past the renovated main floor POWDER room is a dream BUTLERS PANTRY. The upper level features a king size master with loads of closet space and HUGE WINDOWS. 2 more GENEROUS sized bedrooms and an updated 4 piece bath/ Jack and Jill ensuite. The unspoiled basement features laundry and an abundance of storage. A single stall in the detached garage is perfect for Calgary winters. Walk to dining and shopping, only minutes to downtown. LOW CONDO FEES. This incredible townhouse won’t last long in this fantastic location! Sam and Tamara were great to deal with and were always available when we had any questions. Our home was staged impressively. Thanks Sam and Tamara! Tamara Stearns is extremely proficient in managing a professional business as well as being very hands on with getting the house prepared before listing it on the market. She has an eye for staging and is very skilled in determining inexpensive improvements to help make our home even more marketable. She puts a lot of effort into utilizing every marketing tool/resource available to make sure your home is seen by as many viewers as possible. Tamara is very strategic and has a plan. She is organized, methodical, and has a process that works. I’ve never worked with a realtor that was more capable as well as being such a pleasure to work with. Tamara is results driven but also loves what she does, that became very apparent as we built a relationship with her. All of these things become even more critical when markets become more challenging, as they have been recently. We would highly recommend Tamara for all your real estate needs - whether you are buying or selling. It was refreshing working with Tamara as my realtor. When we were searching for a house, she was very knowledgeable on the houses and the area and whether or not the house would be a good investment. Tamara did not pressure me in the least and maintained a high level of professionalism throughout. When I decided to make a bid on the property Tamara was very efficient and aggressive with the negotiation and got me an excellent deal. The same went for selling my condo. In a tough seller’s market, Tamara did a fantastic job of marketing my condo, so good in fact that my condo sold in 2 weeks while most other properties on the market were taking more than a month to sell. Not only that, but she negotiated full asking price and a possession date that suited both my needs and my buyers needs. Tamara and her team are fast and efficient in all aspects of their job. Whenever I had a question or concern Tamara would address it within a few hours. I would highly recommend Tamara as a realtor. My selling experience with Tamara was exceptional. From providing a comprehensive market analysis that helped determine the right asking price, to staging my home for excellent showing, and ultimately guiding me through the selling process. Her strategic, innovative approach to selling my home gave me confidence from beginning to end. With Tamara I came away from the whole experience feeling that I?d received a high-quality professional service and would recommend her to anyone looking to sell their home. I would like to let you know that it was a pleasure having you as our real estate agent. Your knowledge and friendly approach made Tristan and I feel very comfortable throughout the buying process. We appreciate that you took the time to get to know us and show us a wide range of properties. By sharing with us your knowledge and expertise, we were confident that we were making the right decision about our purchase. I have already recommended you to friends and would highly recommend you in the future. Working with you made our first home buying experience a joy and we look forward to working with you again.